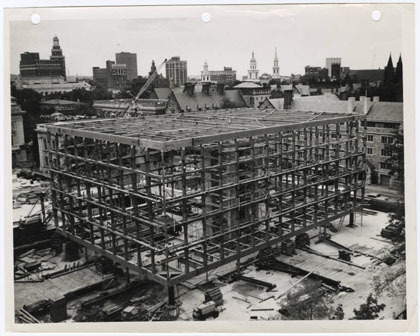 Documenting the construction of the Beinecke Rare Book and Manuscript Library, this collection of photographs captures the transient stages of a massive, three year project. One of the largest buildings in the world devoted entirely to rare books and manuscripts, the library was designed to have room in the central tower for 180,000 volumes and in the underground book stacks for over 600,000 volumes; it now contains well over 500,000 volumes and several million manuscripts. The building, of Vermont marble and granite, bronze and glass, was designed by Gordon Bunshaft, of the firm of Skidmore, Owings and Merrill; the George A. Fuller Construction Company of Hamden, Connecticut was the general contractor. Work began on the building in 1960 and was completed in 1963. The white, gray-veined marble panes of the exterior are one and one-quarter inches thick and are framed by light gray Vermont granite. These marble panels filter light so that rare materials can be displayed without damage from harmful ultraviolet light. From the exterior, however, the building’s powerful stone geometry serves to dominate the space it occupies in Hewitt University Quadrangle, amidst neo-Classical and neo-Gothic neighbors. The building and its endowment are the gift of Edwin J. Beinecke, Yale 1907; Frederick W. Beinecke, Yale 1909; Walter Beinecke, Yale 1910; and their families.